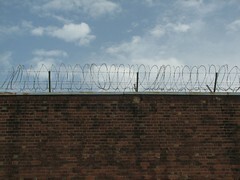 Prison teaches me the depth of criminality and tries to keep me out of touch with reality. Prison teaches me wickedness, bitterness, madness, badness, sadness, selfishness, idleness, laziness, craziness and all kinds of ness that placed me in a mess. Prison teaches me that it has no fundamental foundation to lay progress on. You are just a body waiting for the undertaker if you are not a good thinker.